UN human rights experts have expressed concerns about terrorism charges laid against 10 human rights defenders working with India’s poorest and most marginalised communities, including the Dalits, and urged authorities to ensure their cases are promptly heard in line with international law. All were arrested in connection with investigations into a public meeting organised a day before the 200th anniversary of the commemoration of a battle at Bhima-Koregaon, an important cultural event and a symbol of Dalit empowerment. Police subsequently claimed that the human rights defenders had links with ‘unlawful organisations’. 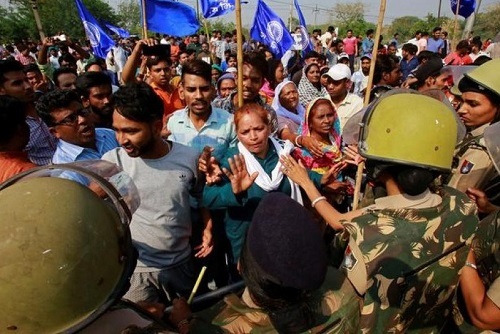 “We are concerned that terrorism charges brought in connection with the commemoration of Bhima-Koregaon are being used to silence human rights defenders who promote and protect the rights of India’s Dalit, indigenous, and tribal communities,” the UN experts said. Surendra Gadling, Rona Wilson, Shoma Sen, Sudhir Dhawale and Mahesh Raut were taken to the city of Pune on 6 June, where they remain imprisoned in Yerwada Central Jail, following repeated extensions of their detention periods. Sudha Bharadwaj, Vernon Gonsalves, Arun Ferreira, and Varavara Rao remain under house arrest. The UN experts welcomed Gautam Navlakha’s release from house arrest on 1 October 2018, but expressed dismay at the Maharashtra Government’s subsequent appeal of the court’s decision to grant his release. “We are very concerned about the charges against the human rights defenders and the continuing detention of nine of them,” the UN experts said. “All have been active in peacefully defending human rights, including those of marginalised and minority communities, political prisoners, and women, and their arrests appear to be directly related to their human rights work. “We appeal to the Indian authorities to ensure that due process, including the right to a fair trial, is provided to all detained human rights defenders, with a view to their prompt release. We urge the Government to refrain from engaging in the criminalisation of human rights defenders in general, including through the use of overly broad national security legislation,” the experts said. The 10 activists were arrested under the Unlawful Activities Prevention Act (UAPA) during two nationwide crackdowns: the first on 6 June 2018 and the second on 28 August 2018. “The UAPA’s vague definition of ‘unlawful activities’ and ‘membership of terrorist organisations’ confers discretionary powers upon State agencies, which weakens judicial oversight and diminishes civil liberties in the process,” the UN experts said. The experts are in contact with Indian authorities about this case.